Acute spinal cord compression (ASCC) is a surgical emergency requiring immediate neurosurgical treatment. Prognosis of the condition can vary and is most dependent on the time between diagnosis and treatment. In this article, we shall look at the risk factors, clinical features and management of acute spinal cord compression. Any pathology that can predispose to a narrowed cord canal also lead to a greater risk of developing acute spinal cord compression. These include inflammatory conditions (such as rheumatoid arthritis or ankylosing spondylitis) or degenerative conditions (such as ligamentum flavum hypertrophy or osteophyte formation), contributing to a spinal stenosis. 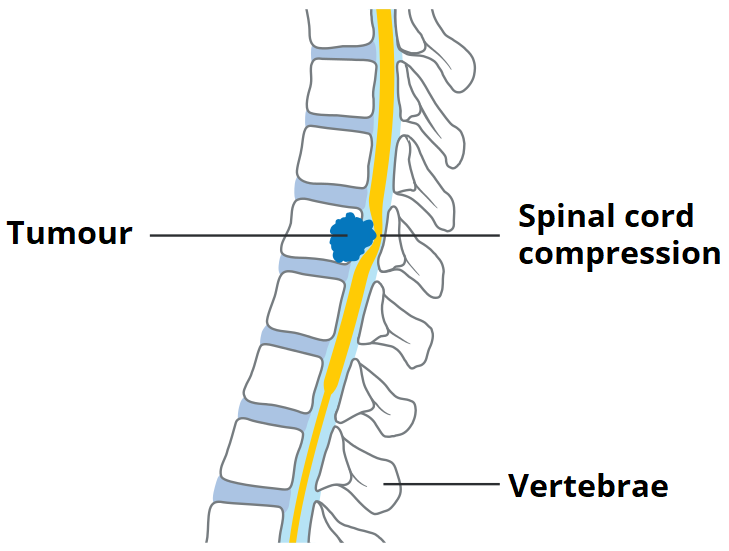 Figure 1 – Vertebral metastases are the most common cause of acute spinal cord compression. The history and examination are vital in differentiating acute spinal cord compression from simple disc herniation. Sensation and proprioception will often be impaired at dermatomal levels below the cord compression. Pain can also be reported, often aggravated through straining, such as coughing or sneezing. There will be bi- or unilateral weakness in most cases (around two thirds of MSCC patients are non-ambulatory at diagnosis). There will be upper motor neurone signs present (as opposed to the lower signs seen in peripheral nerve compression or cauda equina sydrome), including hypertonia, hyperreflexia*, Babinski’s sign, and clonus (present below the level of the lesion). Any autonomic involvement is a late stage and therefore carries a worse prognosis. Clinical features include bowel incontinence or constipation or urinary retention*. Additionally, there may also be evidence of the underlying cause, e.g. malignant features such as weight loss and tiredness. Cauda equina syndrome is typically caused by a lumbar disc herniation, compressing the cauda equina. They also present with lower motor neurone signs and bladder/bowel disturbances. The gold standard investigation for a suspected ASCC is an MRI of the whole spine (Fig. 2). NICE guidelines recommend the imaging should be carried out within a week if spinal metastases are suggested and within a day if the cord is believed to be compressed. Routine blood tests will be helpful, especially if the underlying cause is not apparent. Given the high chance of surgical intervention if ASCC is present, a Group & Save and clotting screen should also be taken. High dose corticosteroids should be given immediately to improve the patient’s functional prognosis, alongside a PPI for gastric protection. Following imaging, an immediate referral to neurosurgery and an oncological opinion will need to be sought as required. If the patient is fit enough, surgery is the definitive treatment option for MSCC via decompression; in cases of malignancy, depending on the sensitivity of the tumour, radiotherapy and chemotherapy may also be started concurrently. The prognosis of MSCC depends on the extent that the disease has progressed before decompression, as well as the underlying cause. One of the best indicators of prognosis is mobility state at the time of treatment; 90% of ambulatory patients will remain mobile, whereas only a third of non-ambulatory patients at presentation will regain an ability to walk. Due to the nature of metastatic disease, it is likely that a patient will be in an advanced phase of cancer, if this is the underlying cause. Therefore, the survival rates for MSCC patients tend to be only approximately 6 months after the onset. Which of the following is a typical feature of acute spinal cord compression? Which is the definitive treatment for acute spinal cord compression? Which of the following primary malignancies does NOT commonly metastasise to bone?